Contemporary man sometimes sees only the challenges immediately before them, believing these problems unique to their life, but they are not. Any student of history knows that each civilization goes through the same life-cycle with the same results, the same political strife and intrigue. When Europeans began arriving on the shores of North America they found small clusters of Native Americans. Some groups lived peacefully with their remote neighbors and welcomed those arriving in their big European ships. Other Native Americans seemed to be in a constant state of war against everyone, including those just arriving. Language, customs, rituals were all different. Each side mistrusted the other. Although these small enclaves had different technologies than the new Europeans, they seemed to have the same hierarchy. Based on their dress and weapons, the Europeans made an assumption the Native Americans were a backward culture, ignorant, uneducated, perhaps even being a sub-human species and for almost 3 centuries, this was a widely held belief among many Europeans, particularly the English. The Spanish were interested primarily in exploiting the Native Americans they came in contact with and converting them to Catholicism. The French seemed to have the best interactions with the Native Americans. They lived closely with them, setting up trading posts and making personal relationships. The English settlers, would be more likely to distrust the Native Americans and perhaps for good reason. This level of thought setup almost 3 centuries of conflict and war that only in the last 75 - 100 years changed with any significant meaning. Long before Ohio became a state, the land was home to numerous highly organized and prolific civilizations that spread across the eastern half of North America. Prehistoric evidence suggests that some of their large population centers may have been home to 500,000 people or more. Although Ohio had some large cultural centers, none were on that scale, but nonetheless, there were numerous large urban centers here that we are only just beginning to get a clear picture of their size and scope. We know that these pre-historic civilizations date back over a span that can be broken down into 4 basic time periods covering 1000s of years. These periods are identified by the tools they used, the ornaments or decorations they created, the pottery they used, and development of their agricultural practices. The Paleoindian Period dates back to a time between 12,000 and 10,00 years ago. During this time the culture consisted of small family or clans that were using spears tipped with fluted flint that made an effective hunting tool against the large scale animals found here. At that time the mastodon and sabre tooth tigers were roaming the soggy flat land of western Ohio still saturated from glacier melt. 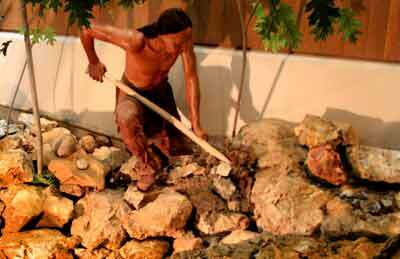 At this time hunters had already discovered the rich outcropping of flint found at Flint Ridge. They found that this highly specialized stone could easily be chipped to form their spear points that also had an extremely sharp edge that could cut through the thick hides of the game they hunted. From about 10,000 to 3,000 years ago, there was a period we call the Archaic Period. During this time technology improved for the hunters. Instead of just sticking a sharpened stone at the end of their spear, if they fashioned notches at the base, they could secure the points to smaller, narrower shafts that could be thrown further with more accuracy. They also were developing grooved axes that could be used to help bring down the large animals in an efficient manner. A new weapon was also beginning to be seen: the atlatl. This was a weighted spear that could be thrown with leverage from the spear thrower. With the improved weapons and more efficient hunting techniques, left more time than for just survival, evidence indicates that began to create personal items of adornment that had no relationship to hunting. Adornments including hairpins made from animal bone, and necklaces made from shells. Sometime about 3,000 to 1,000 years ago, another dramatic change became apparent. Pottery was developed to cook and store food for longer period of time. Crops were beginning to be grown on a small scale, in family gardens. They also began creating ritualized tablets, pipes made from pipestone. Far-ranging trade was developing. More personalized ornaments were found at this time made from materials such copper from around the Lake Superior area and mica from the Allegheny Mountain area, shells used in necklaces came from the Gulf of Mexico area. During the Paleoindian Period, there were roaming groups of people here off and on for thousands of years. They followed the herds along with the seasonal climate changes. Around this time that we begin to see the first signs of an organized culture. They begin to bury their dead. This was the beginning of the Mound Builder's Age. We don't know why they began expanding their burial practices to include more dead, perhaps it was a form of honor for leaders of the group. Over time they began erecting these basic forms of dirt into large mounds identifying for all generations that this was their history, that each successive generation is built upon the last. This group of people we have given the name Mound Builders. In time they expanded their mound building for purposes other than burial. They began forming complexes that were permanent identifications of where they lived, and who they were. Because they had no written records, we don't know the name they actually called themselves. We have further classified the Mound Builders of Ohio into three different successive cultures: Adena, Hopewell, and the Fort Ancient. The Mound Builder's Age changed over time. The first Mound Builders started with basic singular mounds constructed over the graves of important members of their local clan. 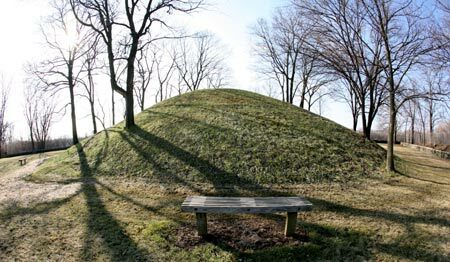 This group of Mound Builders became known as the Adena because the first mound that was studied and excavated was located on Thomas Worthington's estate in Chillicothe he called Adena. The Adena Culture was widespread throughout the state. Many of these singular burial mounds can still be seen. From tools and recovered pottery remnants it is evident that they were beginning to develop farming skills to supplement their hunting skills. They probably were nomadic in that they moved with the seasons, possibly moving south in the fall and returning in the spring. Over the centuries the Adena culture morphed into what we now call the Hopewell Culture. The Hopewell Culture was more robust in their mound building. They continued in part building burial mounds, but they also began expanding their constructions by building massive earthwork complexes. There seems to have been some common design elements used in these earthworks which was primarily a large circular structure attached to an even larger rectangular embankment. These massive embankments were not used for burial purposes although there were often burial mounds inside the enclosures as well as outside the walls. Artifacts including pottery and carvings also began displaying increasingly complex forms and craftsmanship. The Hopewell Culture also expanded the farming practices the Adena Culture had begun to develop. This allowed for larger communities not dependent solely on hunting. The remains of multiple large earthworks were common in some areas separated by just a mile or so. There was also evidence to suggest that the Hopewell Culture carried on extensive trading with other people across North America. 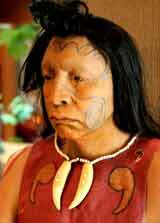 Sometime around 1000 AD we begin to see another dramatic shift in the Mound Builders. They stop building their typical circular / square enclosures and start constructing what appears to be complex fortifications on high plateaus overlooking navigable waterways. This period lasted a few hundred years or so. It became known as the Fort Ancient Culture and they were located in southern Ohio. The first of these structures was identified as Fort Ancient. Since then a number of these defensive structures have been discovered. This was the last of the Mound Building Cultures. Most of the earthworks visible today are the result of reconstructing the mounded earth from early survey documents and descriptions. Unfortunately, when early settlers arrived in the Ohio Territory, many did not see any reason to preserve the earthen walls that interfered with otherwise ideal farm land. The large conical burial mounds were a different story. These were usually left intact, some even became tourist attractions during the latter half of the 19th Century. However, many of the singular burial mounds are the original mounds, even though they may have been excavated. The burial sites of American Indians are rarely excavated today unless threatened by erosion or construction. Under terms of The Native American Graves Protection and Repatriation Act, American Indian tribes are often consulted before the excavation of graves. Remains that had been removed from earlier excavations are in some instances being re-buried. We know from the evidence that the Mound Builders evolved over the centuries. Technologies changed, rituals changed, farming changed. At some point their culture stopped being identified with a central location. Did that mean they no longer existed as a people? Did some internal conflicts or power struggles cause the breakup of the culture? No one can say for certain. There is certainly no shortage of theories about the Mound Builders, where they came from and why they stopped. When a civilization has no preserved written history, the fate of that civilization is left to speculation. Here are a few of the more plausible speculations. Native Americans from eastern North America who were mostly hunters, came into the Ohio Territory and waged a war against the primarily agricultural Mound Builders. Later Mound Builder sites, that we have identified as the Fort Ancient Culture, were constructed on elevated positions, with walls surrounding increasingly larger villages suggesting that these sites were created as defensive positions. Excavations of grave sites, particularly in the northeast, show numerous remains that had arrowheads embedded in the skeletons. Some remains besides having multiple arrowheads, also showed signs of animal teeth marks suggesting that the individual may have been killed outside the compound and left to scavengers before being brought inside for proper burial. Although their populations were more dense, they were highly dependent upon their harvest for enough food to last until the next harvest. An enemy looking to overcome them could easily destroy the crops before harvest. This tactic was used extensively in later conflicts with Native Americans. Another reason may be attributed to a blight that effected their crops. This is complete speculation, but for a civilization that depends so much on fall harvests, anything that threatens those crops could be a cause for problems. Another possibility is that they died from disease. Numerous skeletons show that they died before the age of 50, and most died in their 30s. We know that after Columbus opened up North and South America to land-starved Europeans, they brought with them several highly contagious diseases that had come into existence from the close proximity of domestic animals and humans in Europe. The western hemisphere had no domesticated animals and so these diseases had not developed and there was no built in immunity to these diseases. Although it appears that for the most part, the Mound Builders had left Ohio before Columbus, there were still a few Native Americans using burial practices similar to what the Mound Builders used. This type of activity disappeared completely some 300 years ago. It seems that new discoveries are indicating that North America had been visited by Europeans before the Italian explorer made his historic voyage. Besides the documented explorers including Columbus and those that came after him, there also seems to be evidence that other European explorers reached the continent long before Columbus. Could it be that they too carried diseases that the ancient Americans had no resistance too? Could it be that these earlier explorations led to the destruction of the American populations long before the early Spanish explorers reached the Ohio valley? What we can deduce is that these pre-historic Americans disappeared from Ohio and their villages became just piles of dirt. As the land began to be settled once again by a farming population, the built-up mounds eventually would be leveled as either farming activity increased or the ancient villages were leveled to make room for new towns and cities. Did Explorers Inadvertently Kill the First Americans? We know that explorers coming to the Americas after Christopher Columbus, brought more than just trinkets to trade. They also unknowingly brought deadly plagues that killed 1000s of Americans already living in the land. But, did even earlier explorers, such as the Vikings, bring such plagues to the Americas as well? We know that when the first European settlers came and setup housekeeping along the Atlantic coast, they found small groups of Native Americans. Could these groups have been descendents from survivors of the earlier plagues brought over by Viking explorers? We do know that there did not seem to be any large organized populations such as those demonstrated by the Mound Builders found in the Midwest. It is quite possible that the Mound Builder civilization had already been destroyed by even earlier explorers than the Spanish who arrived in the early 1500s. So when the first settlers arrived, they found a land that was mostly unpopulated or populated by disperse Native American clans. William Corless Mills, born and raised on a farm in Montgomery County, began as a boy collecting Indian artifacts from local farm fields. He attended the Ohio State University and the Cincinnati School from which he graduated in 1885. Mills led a number of major excavations of the original Adena Mound in Chillicothe as well as the Harness Mound, Mound City Group, Seip Mound (the Seip Conjoined Mound), Tremper Mound, and the Baum Village site. Mills faithfully published the results of these excavations in the Ohio Archaeological and Historical Society Quarterly.